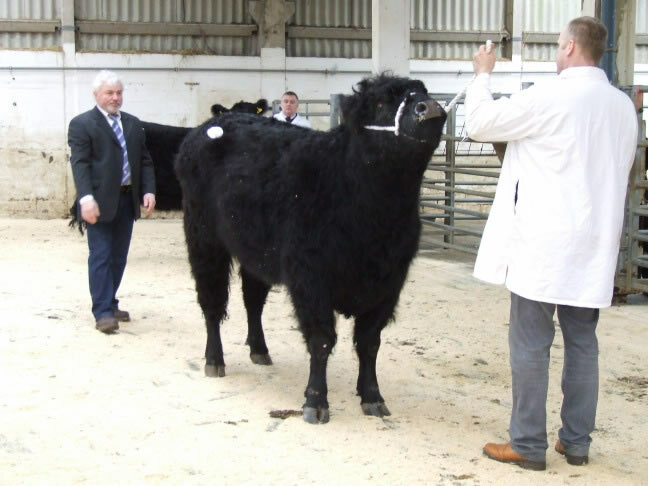 Galloways were very much in demand at the Society Show and Sale held on Friday 17th February, averages in all sections showed a significant increase on last year and with only two animals not sold, many potential purchasers would go home empty handed. The bull section got off to a great start, with Messrs McClymont, Kirkstead selling the first in the ring, a 7 year old bull Penninghame Major, he made 5200gns to Dennis and Margaret Gall, Stirling. Dennis then sold the male top price of the day, a son of Major, Commando of Gall-way for 6500gns to Rainer Mutzel, Germany. The December 2010 born bull has an impressive pedigree as his dam was 1st prize Junior heifer at the 2009 Royal Highland Show. The Champion, Barlaes Joker from Messrs R & M Fergusson, Barlaes, Dalry, sold for 4500gns. This Barlaes Colossus son and out of Barlaes Grace 55th is off home to the South of England with Messrs Able, Devon. There was two bulls at 5000gns, again Dennis and Margaret was in the money with Everest of Gall-way. This ones dam, Silverbell 12th of Corrie was Breed Champion at the 2004 Royal Highland Show, all the sons sold off her has averaged 5000gns. Everest was purchased by Mr W Henderson, Whitehill, Lockerbie. Also sold for 5000gns, Thor of Over Barskeoch from Messrs Wallace, Over Barskeoch, Dalry he went home with RE Jamieson, Garrochtrie, Port Logan, Stranraer. 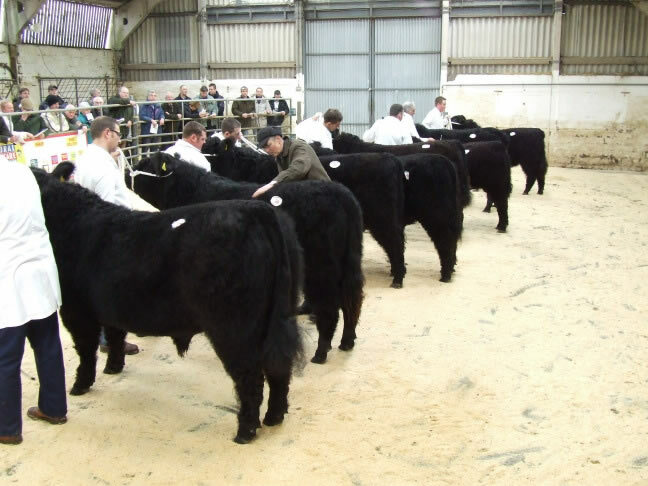 Also to go home with Mr Jamieson was 23 females, which included two heifers at 2200gns, Gipsy Queen of Nether Cleugh from Peter Hunter Blair, Nether Cleugh, Dalry and Kirkstead Amber T18 from RA McClymont & Son, Kirkstead, Yarrow. 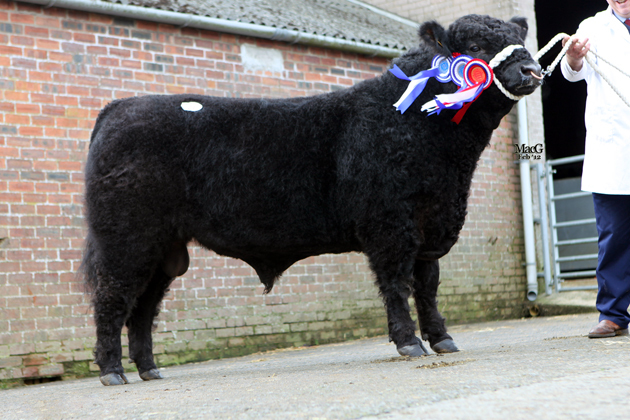 Peter Hunter Blair also sold his only bull entry for 4800gns, Solomon of Nether Cleugh is off for export to Germany. Solomon’s sire, Kirkstead Nancy Boy was National Show Champion in 2011 and Male and Reserve Overall Champion at the Royal Highland Show 2010 and 2011. Jim and Selina Ross, Romesbeoch sold Samson of Romesbeoch for 4500gns to Cnewr Estates Ltd, Sennybridge, Brecon, Powys. Samson has an Irish sire Xeros of Upper Buckna and out of Patsy 80 of Romesbeoch. Cnewr also purchased 8 females, 6 being from the unled section, the top price being 1850gns for Barlaes Grace 76th and Barlaes Brownie 200th. 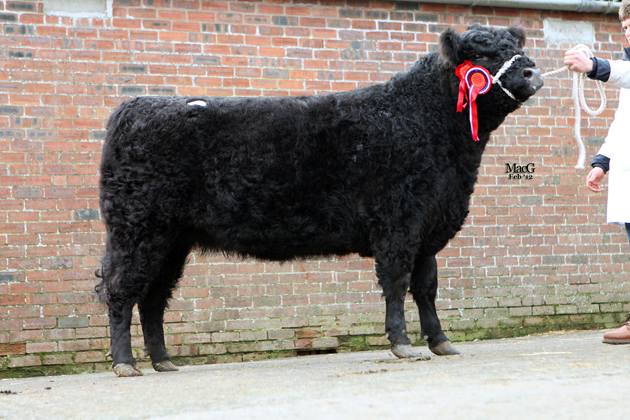 Romesbeoch also sold a heifer for 2000gns, Beauty 995 of Romesboech to Mr Jamieson, Stranraer. The Female champion Blackcraig Noreen R336 from the Finlay Family, Blackcraig, Corsock, Castle Douglas made the top female price of the day 2800gns to judge Horst Kraft, Germany. Next top price for the Finlays was Blackcraig Moss Rose R337, she made 2100gns to I A Kennedy Moffat Lochurr, Moniaive, Dumfries. Son, Ian Finlay, was also in the money, selling his heifer, Blackcraig Star, Star has a German sire and dam and was sold to Germany for 2200gns. Two pure bred Galloway steers from Kilnstown Farms Ltd, Bewcastle, Carlisle made 1050gns and 950gns was went home with Messrs Paterson, Low Threemark, Stoneykirk, Stranraer. I A Kennedy Moffat, Shillingland, Lochurr, Moniaive. champion at the Society presale show. This May 2010 born is from the home bred sire Barlaes Colossus and out of Barlaes Grace 55th. The overall reserve male champion was the Junior Champion, Commando of Gallway from Dennis and Margaret Gall, he is a Penninghame Major son and out of Lady Silverbell 6th of Gall-way. 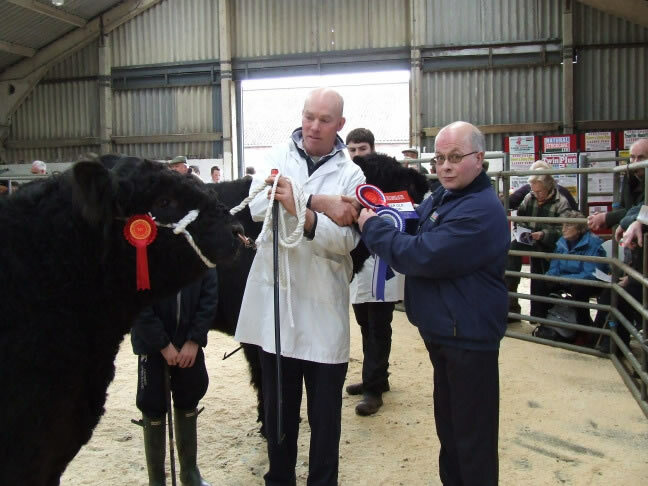 He has an impressive history as his sire was male champion at Castle Douglas Spring Show and Sale in 2006 and his dam was 1st prize Junior Heifer at the 2009 Highland Show. Nancy Boy, he was Champion at the 2011 National Show and Male Champion at the Royal Highland Show 2010 and 2011. The reserve senior champion, Blackcraig Sonic from John and Ann Finlay is a Blackcraig Nimrod son and out of Blackcraig Dusty. J & S Ross took the reserve junior champion with Turbo of Romesboech, his has an Irish sire, Xerox of Upper Buckna and out of Moira 408 of Romesboech.